What a great start to the day; I awoke to the sound of the doorbell, dragged myself downstairs, and as I opened the front door was presented with a pleasant young man who, in his outstretched arm, was holding the new motor controller! I also finished designing and printing the chain guard for one side of the robot and applied a www.mountainwheelchair.com sticker. Hopefully this will prevent any little fingers being from being sliced off! You’ll see in the picture above that I also have the robot hooked up to a laptop. 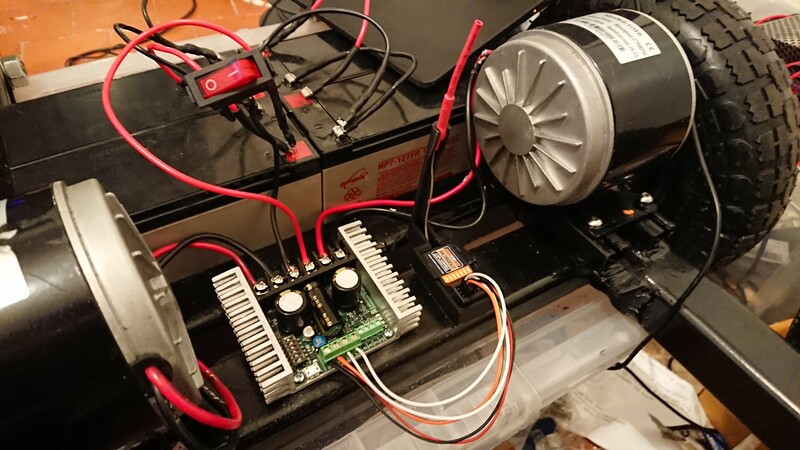 After the fire I decided to spend a little extra on the motor controller and this one will not only provide more power to the motors but also provides the ability to fine tune the firmware and control power curves and a host of other things. Although at £100 it’s twice the price of the previous controller, I think it was money well spent. Especially if it doesn’t go up in a ball of flames. Speaking of which, the burnt controller has been sent back to the good people at RobotShop.com who in turn have given me a refund. In other news, I’m making good progress with the cowling, NextKarting have very kindly donated a lightweight go-cart seat, I’ve had considerable help designing and fabricating a skid-plate, and a new motor controller arrived for the smaller prototype today. I’ll post more details on each as things develop.